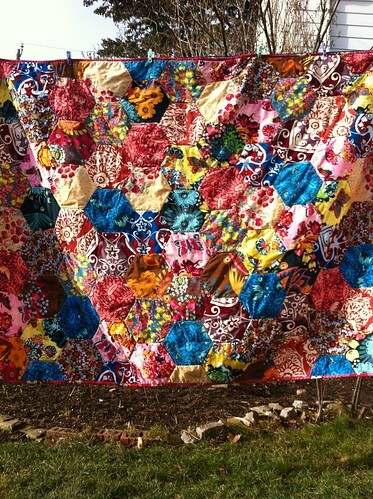 The next thing is this: a quilt top for a new baby. One of our graduate students had a baby girl recently. The student was supposed to be a guest lecturer in my class two weeks before she was due, and - cue Murphy's Law - she came early. 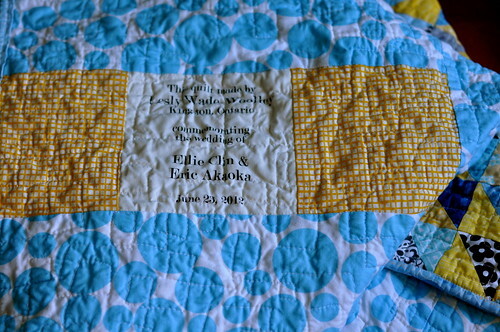 Anyway, my doc student and I thought it would be a nice thing to make a quilt for the new baby. 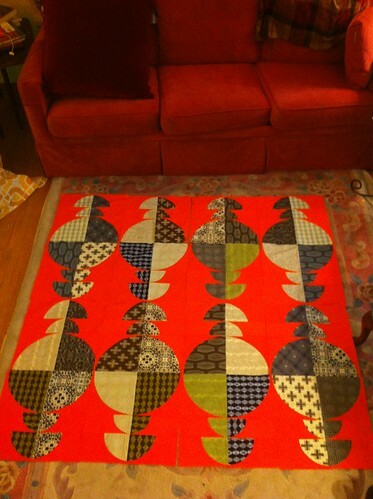 We used the Big Shot Pro, a 3 1/2" HST die, and a bunch of fat quarters to make this sweet little quilt top. 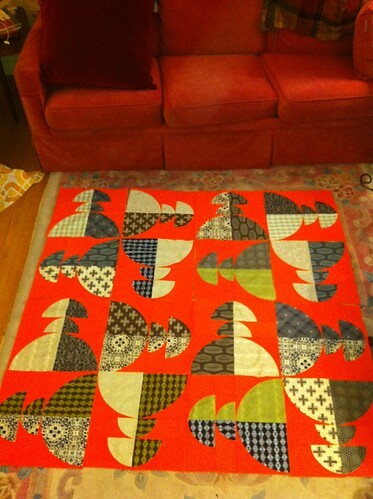 It's based on the Miss Rosie quilt pattern Chip, but we made our blocks a larger size and we didn't use a border. 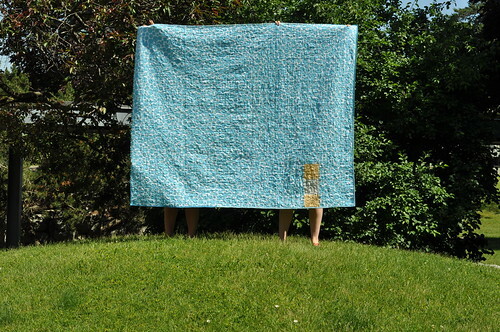 It's 48" square. In this photo, the greys look a bit brown, but they are really grey. I'm thinking some pink minky on the back. 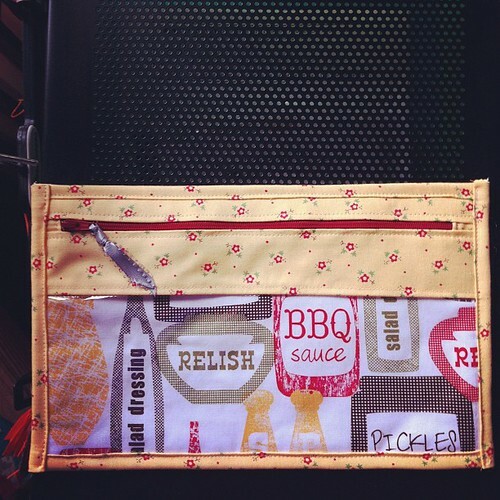 Also, I was fairly restrained on the fabric front during the Thanksgiving commercial frenzy, but I did indulge in some heavy lifting on the Sizzix front. 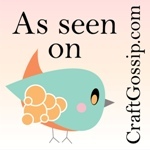 Joann's was having a 50% off sale on Sizzix products. They were mostly dies for paper crafting, but I did get some flower dies and cutting pads. 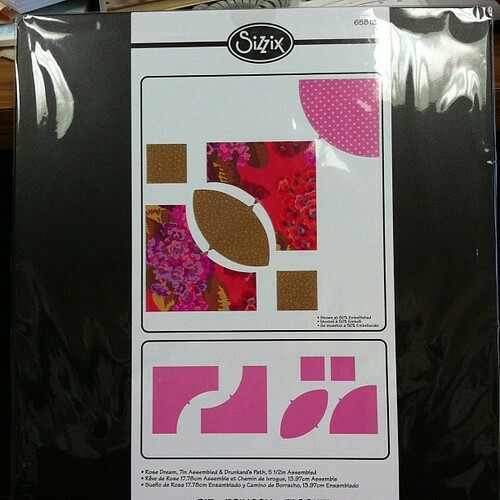 Then the Canadian retailer Stitch in the Ditch had a massive clearout of Sizzix dies for 35% off, including some of the strip dies, HST dies, etc. I bought a LOT of dies. And although it was not on sale, I bought this Rose Dream die, as well. Can't wait to try this beauty out! I'll take pictures! 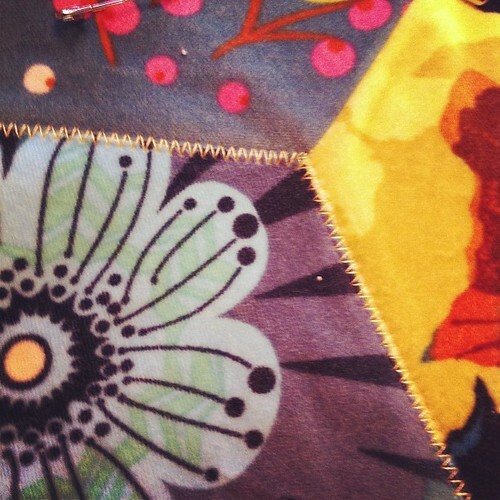 I couldn't touch my sewing machine during September and the first half of October since I was writing a grant proposal. But as soon as I was finished I had the urge to sit down and make some quick finishes. 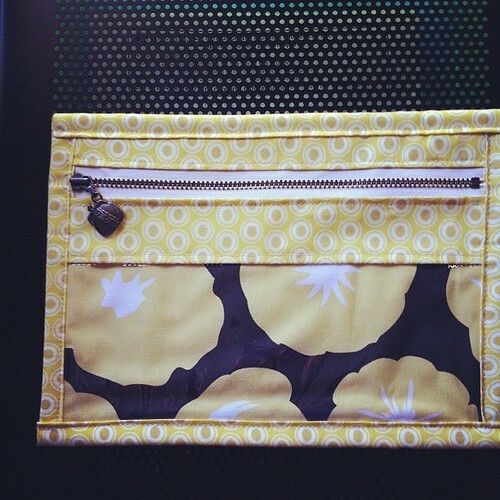 I made four cute zippy pouches - different from the ones I have done before. 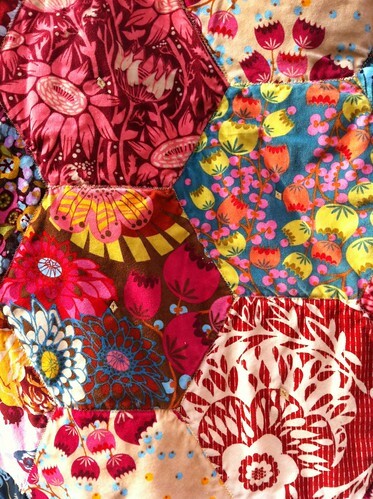 This one is my favourite - I love this Martha Negley feather print. 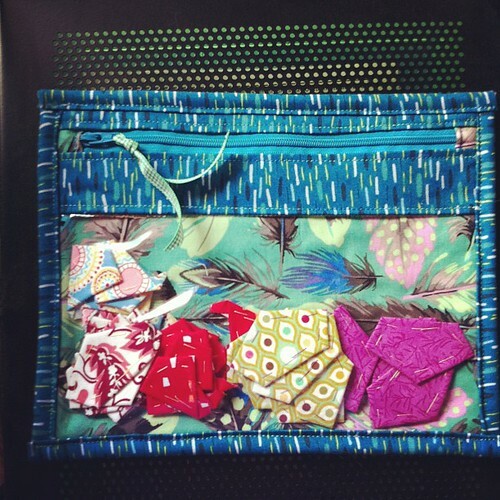 It is a perfect size for storing my EPP pieces. I didn't use a pattern for these, but I was inspired by something I saw on the internet ages ago that stuck in my head. Alas, I don't remember where I first saw the inspiration, so if it rings a bell for anyone, let me know and I'll put up a link. I gave this last one to my daughter - I took a quickie photo with my watch in to show her the clear front, but the watch stayed on my arm. 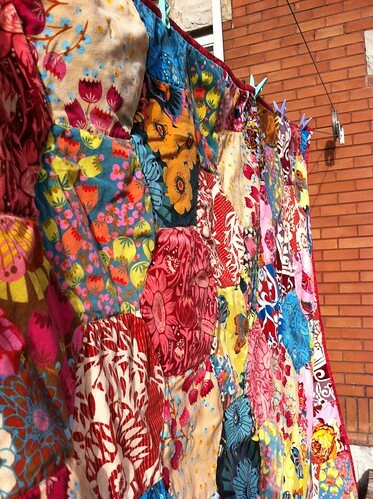 These are lined with batting, which I attached with spray baste. 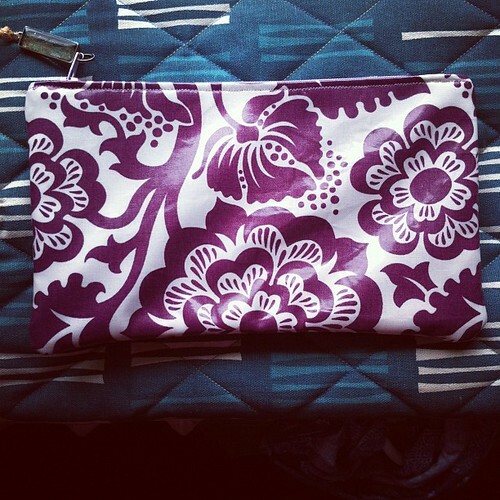 I used a 6- or 10-gauge plastic vinyl that I bought at the local chain fabric store. The backs don't show in these photos, but they are the same print that you see through the front. Super easy, super fast. P.S. It's election day today and I would appreciate your vote! 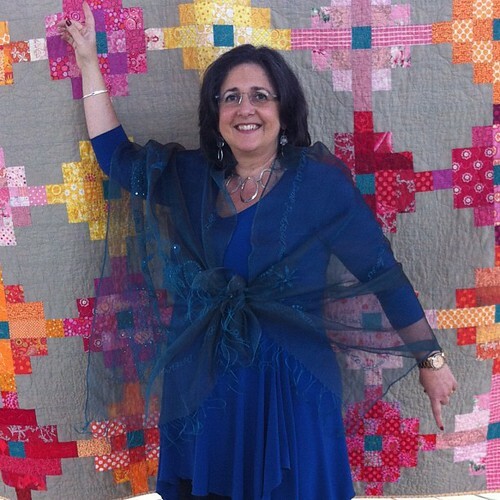 I was nominated in the best quilt photography section of the Bloggers' Quilt Festival. 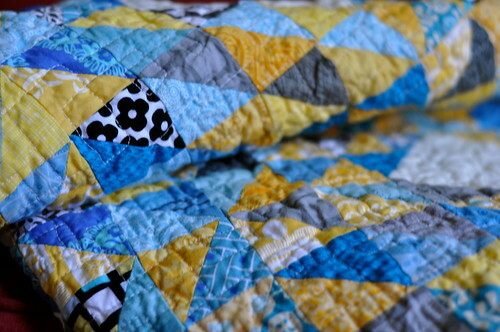 Go here, and scroll down to the Quilt Photography section; vote for Stitchliterate - if you click on the thumbnail you can see the original post and more photos of the quilt. Thanks to all who nominated me! Voting, that is! Tomorrow is Election Day in the US, and won't we all be glad when that is over! Even the Canadian news is awash with polls and pundits weighing in on the presidential election. Well, here's another election you can vote in, and this one is for everyone around the world! 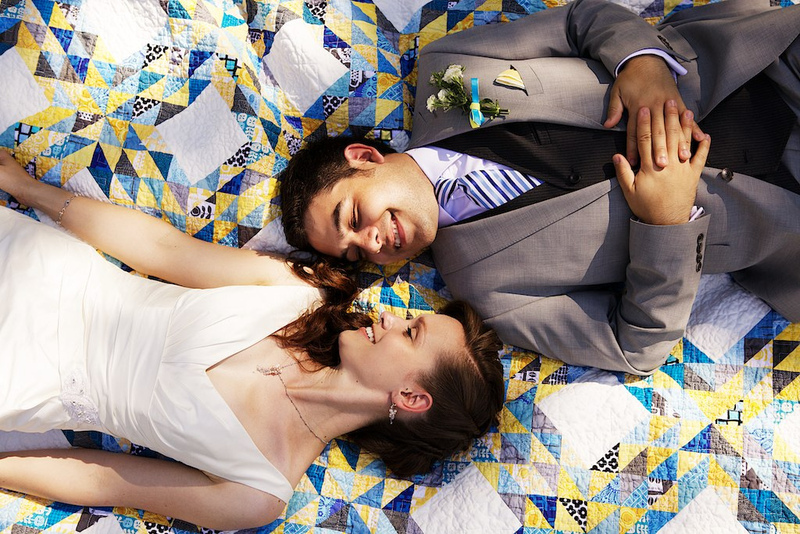 My quilt, Summer Wedding, was nominated for best quilt photography in the recent Bloggers' Quilt Festival. 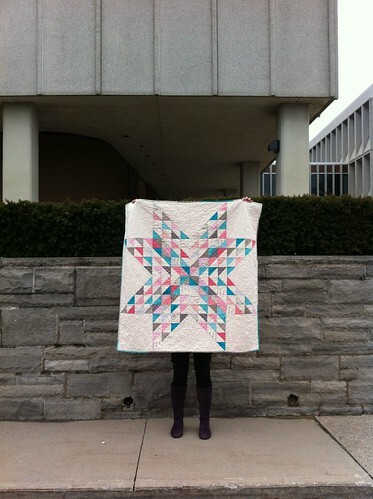 My BQF post where the quilt is featured in full can be found here. I am tickled pink! 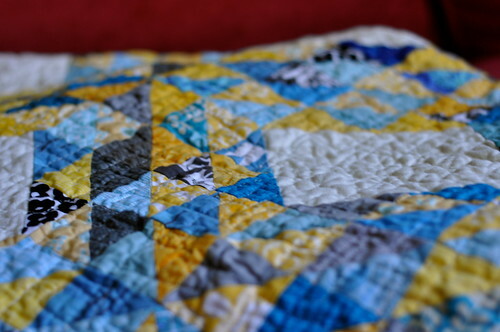 So if you care to vote for it, please go to this link and scroll down to the section dedicated to quilt photography; you'll see this photo above my blog name, Stitchliterate. Give us some clicky love! I would be grateful for your vote! Or should that be galaxy of rose stars? I'll have to sort out what metaphor is best - still working away at these so I think there's plenty of time. 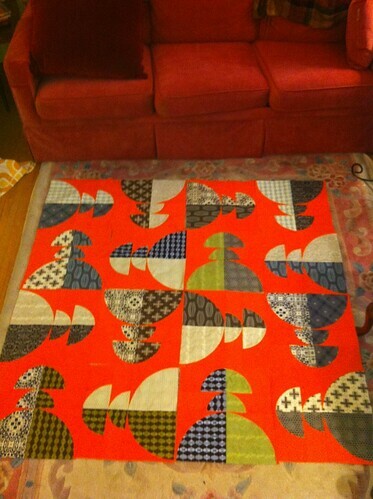 Alison showed her amazing near-finish and asked to see mine. So here they are so far. There are 18 made so far. They are time consuming, since each one has 31 pieces, but the stack grows slowly but surely. I never sit down to watch television without one in my hand. And since my husband and I are currently obsessed with the going through the back catalog of Battlestar Galactica, I am making fair progress. If you want to see the stars individually, go here to my Flickr set. 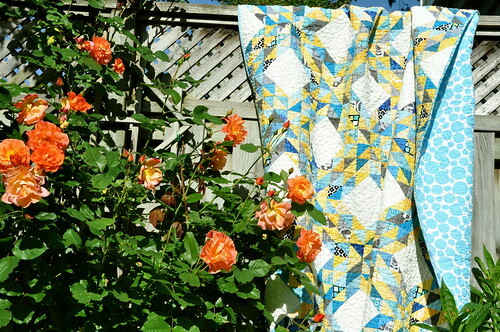 I have always wanted to send a quilt top out to a long-arm quilter, but I never felt like any of my quilts were worthy of such an honour. 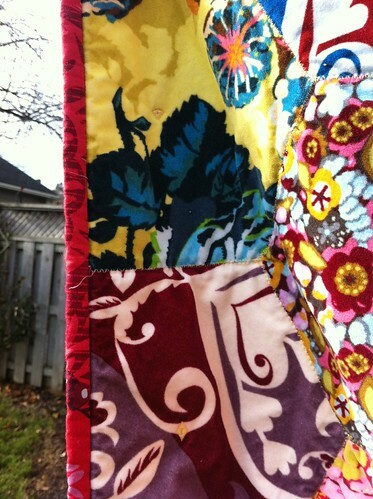 I do an okay job quilting on my domestic sewing machine. 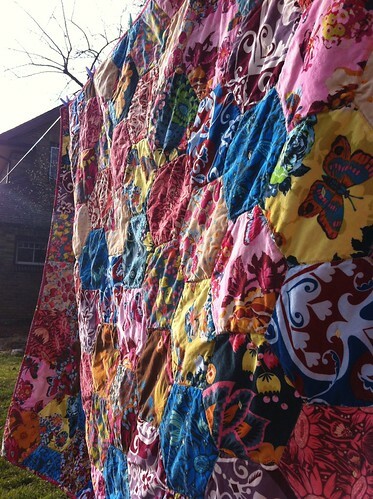 A quilt would have to be pretty dang special to get the LA treatment! The day has come. 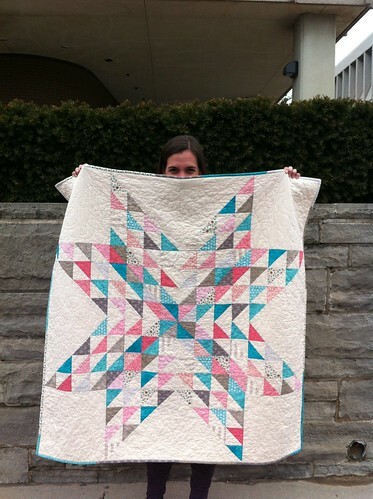 I sent out my EPP stars quilt to Shannon, and she did a tremendous job on it. Truly, it just sings. I could hardly stop petting it enough to put the binding on it. I never thought I could be one of those annoying women who says "I wish I could show you the photos", but apparently I am, at least for now. 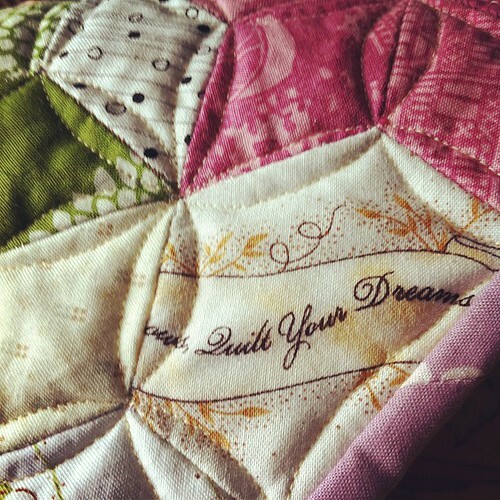 But I couldn't resist sharing this sneak peek, with the exhortation to quilt your dreams. 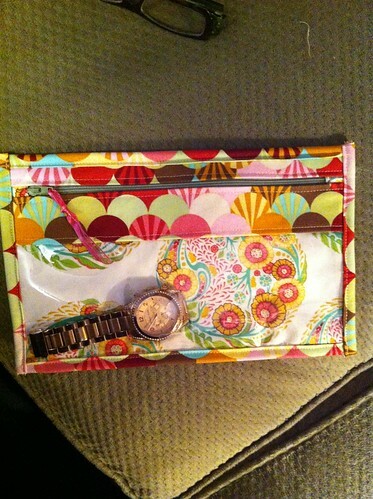 My first trip ever to Joann's Fabrics and what I scored, originally uploaded by Shadrach Meshach & Abednego. 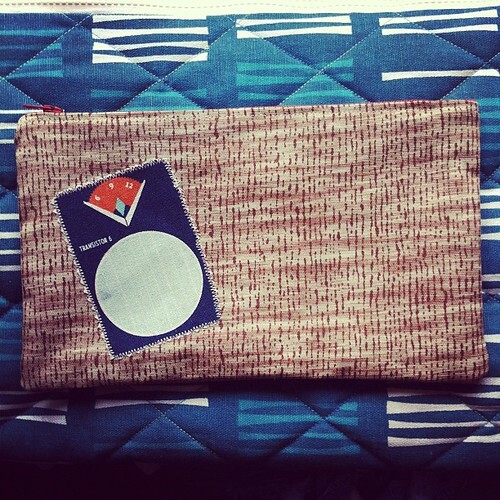 Last night I experienced something new: I went to Joann's Fabrics. 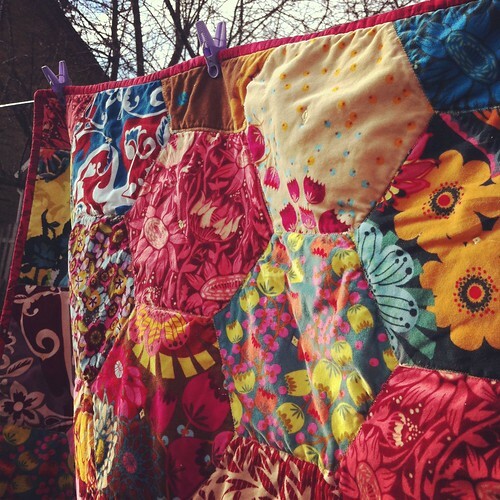 We don't have it in Canada, but every American blogger I read talks about Joann's (usually disparagingly), so I was interested to see what we have been missing. I'm in Munster, Indiana at a training course this week, and I saw it on the way back from dinner last night. We got there at 8:40 and it closes at 9, so I knew I couldn't get in too much trouble. I did check on my phone to see if I could find a coupon on the internet for 40% off, but no such luck. But here is my haul: I'm very happy with it. 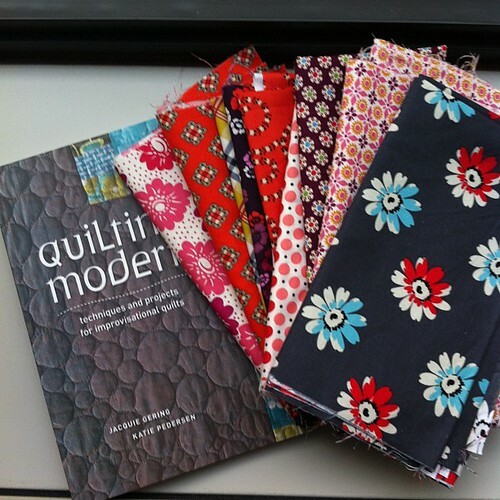 I thought I'd never get any of this DS fabric since it's the Joann's-only line, and this book has been on my must-buy list. Goodness, it's a huge place, isn't it? I certainly did feel like the Country Mouse, looking around at everything there. I can see how the 40% coupon would be a huge enticement to stock up on staples. And how nice it would be to be able to just drive out and pick up the tools and notions you need instead of having to order absolutely everything online, like I generally have to do. 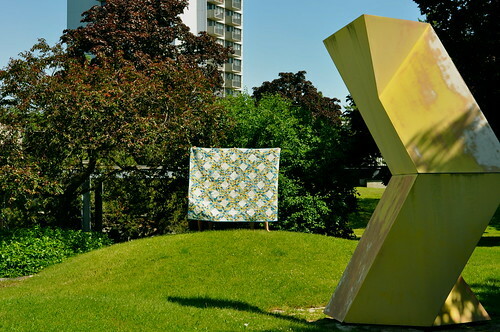 The fabric itself, however, was of limited appeal, which is what I expected, given what everyone seems to say. 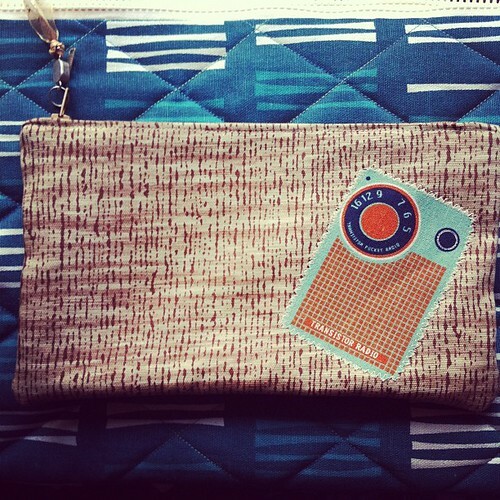 Nevertheless, I am happy that I had the chance to see how the other half lives, and to score a few goodies! 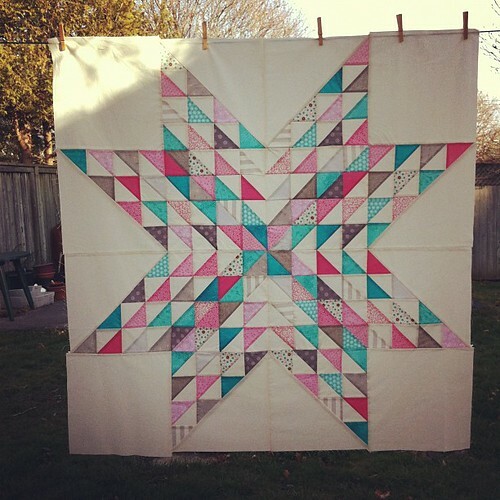 In my last post I explained that my radio silence over the last month or so has been mainly due to the fact that I've been working like a dog on a special quilt for a couple who are getting married this weekend. 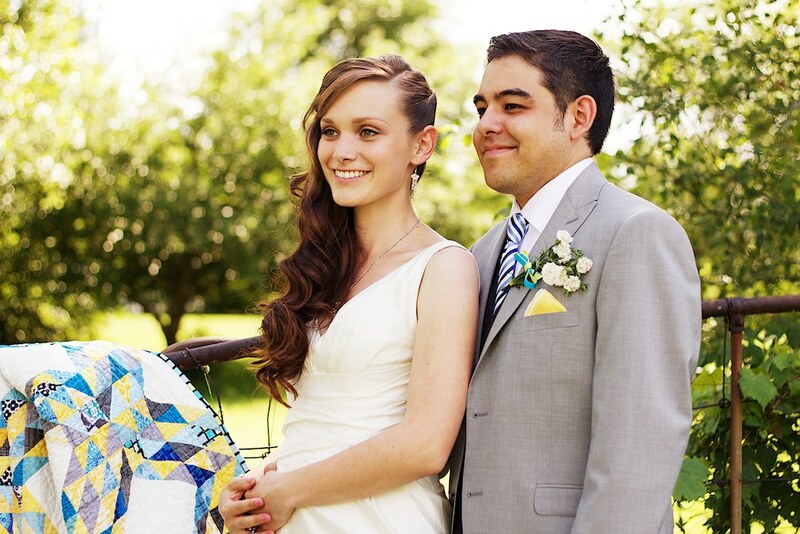 This couple met at university, and in fact, they met in my lab, where they volunteered for a couple of years and did their Honours thesis research. I have been lucky to come to know some very special young men and women in my role as a professor, and it's a wonderful blessing for me to see these two take this step together. 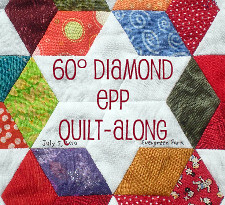 As I wrote in the card I included with the quilt, I feel a bit like the mother of both the bride and the groom, if that is possible in a way that isn't too weird! 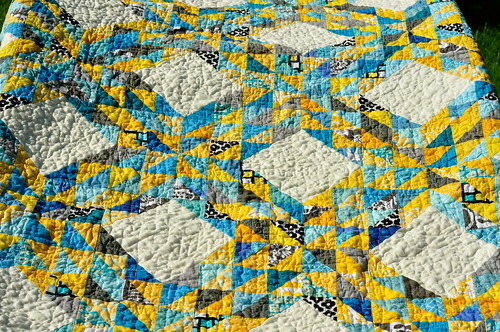 I chose the colours for the quilt from the wedding invitation: blues and yellows, and I threw in some gray and black for a bit of added sophistication. 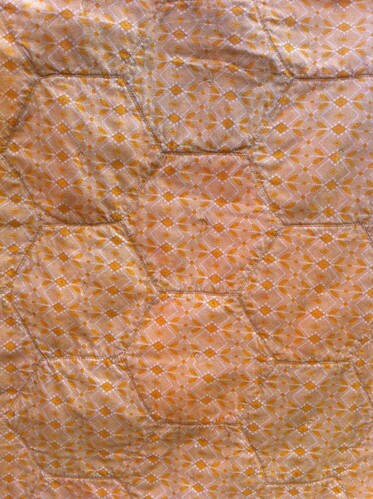 The background is Essex linen/cotton blend in ivory. 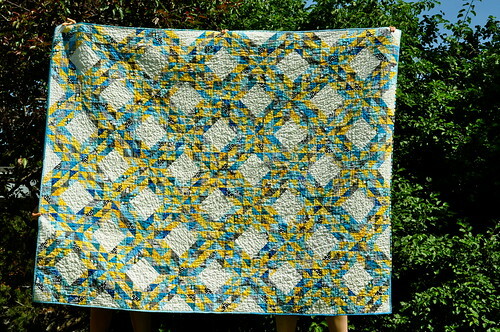 The pattern is a traditional one called Ocean Waves and it's made from 8" blocks, and it finishes about 64" x 70". 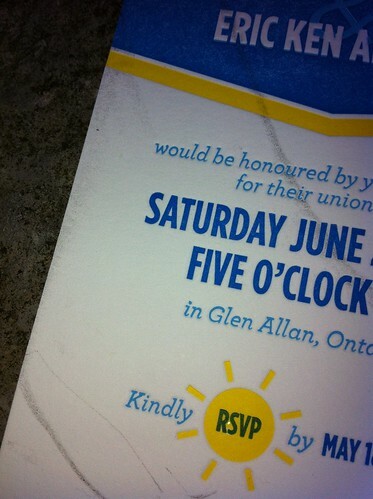 I made a little label for the back, with their names and my name and the date of the the wedding. 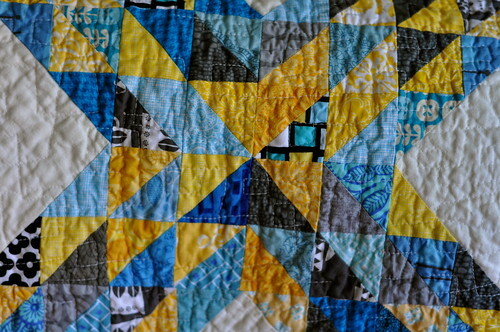 The binding was scrappy, made from some of the 2 1/2" strips that I had leftover from using those Marti Michell templates. 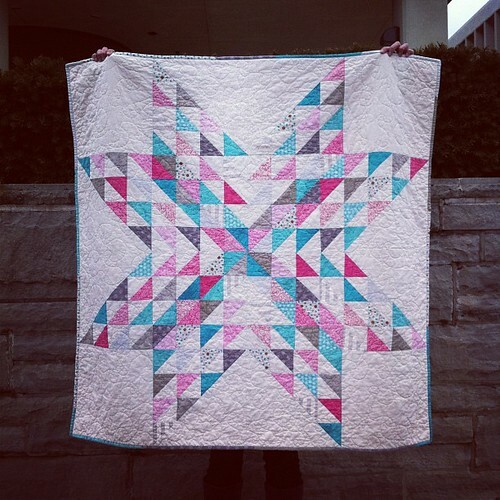 Because the bride-to-be told me straight up that she can't resist surprise busting and she already knew that I was making her a quilt of some description, I had to maintain some element of surprise by limiting any progress shots and keeping the quilt off the blog. But Purolator's online tracking showed me that the quilt has been delivered to her family home, the bride just phoned me to say how much she loved it so I think it's safe to share it now. 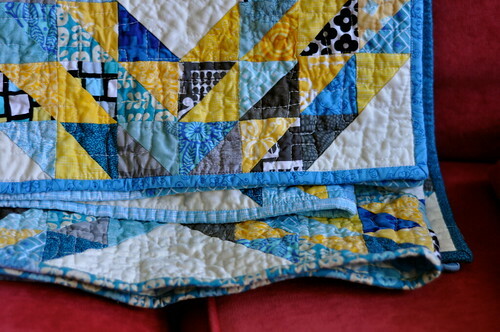 I cannot tell a lie - this quilt really put me through the wringer. It called for 888 HST units. 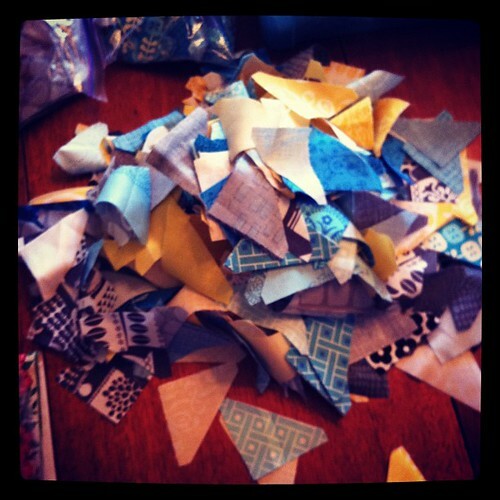 I started out using Marti Michell's templates because I didn't want to make the HST units and then trim to size, but that meant cutting 2 1/2" strips and then using that template to cut each triangle. 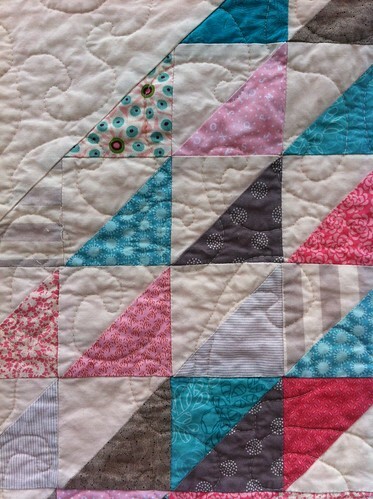 And if you layer too many strips, you start to lose precision. Cut, cut, cut for hours on end. And the template had those blunted corners so that you could match everything up, so those little tiny cuts had to be made, too. It practically killed me. 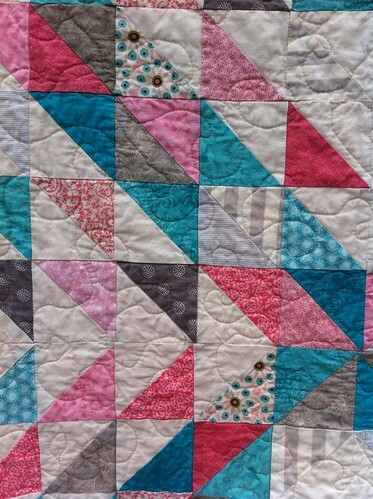 I am well acquainted with the phenomenon of falling out of love with a quilt during the process of construction. 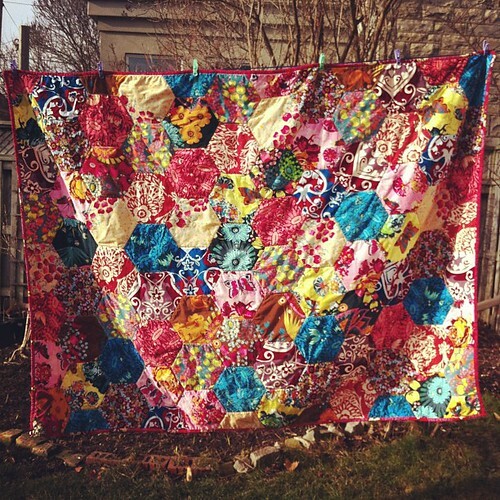 It happens with just about every quilt I make. Somewhere in the middle of it, I start wondering what I had been thinking, and inevitably I begin to feel dissatisfaction with the colour scheme or block choice creeping in. 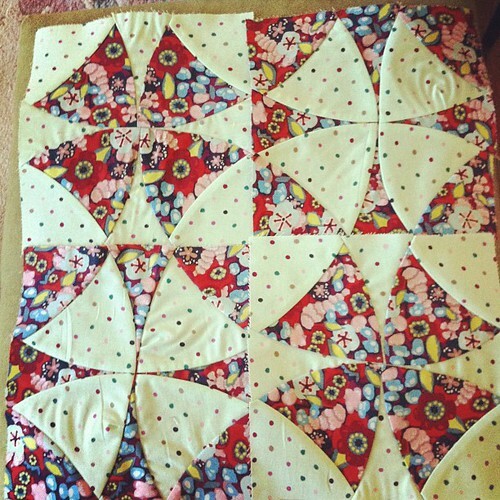 I am experienced enough to know, however, that this misery vanishes like a puff of smoke once the finished quilt comes out of the washer/dryer. 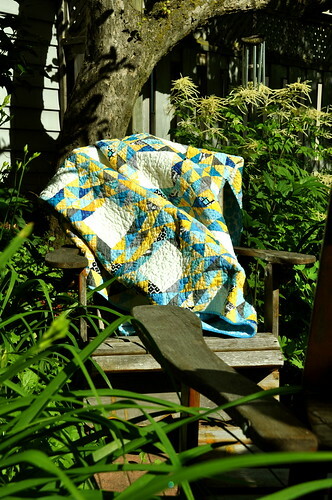 Surprisingly, though, I never wanted to break up with this quilt, and by the time it was finished I was nearly heartbroken that I had to send it off to a new home. 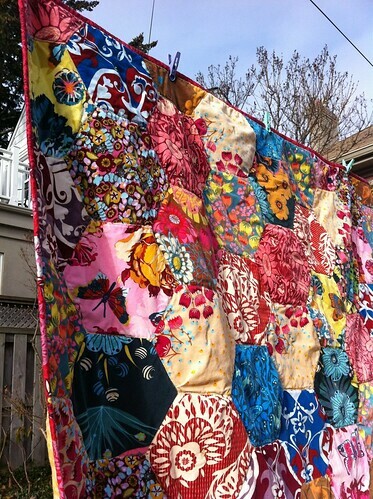 In fact, this quilt was single-handedly responsible for me busting the bank and buying a Sizzix Big Shot Pro. 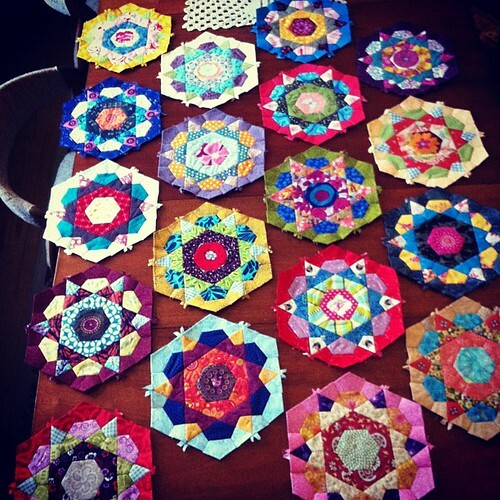 I had made about half the units I needed and could see carpal tunnel syndrome on the horizon. After I ordered the BSP online, I had serious buyer's remorse until about ten seconds after I unpacked it. I cut the rest of the triangles I needed in 20 minutes. Woo hoo! 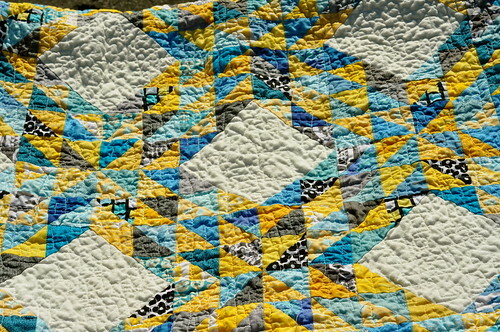 I also ordered the Accuquilt Winding Ways die, since Accuquilt dies are compatible with Sizzix products (but not the reverse) and I'd always wanted to make that block. 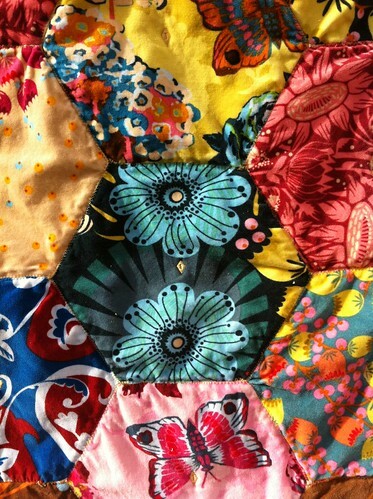 Here's a photo of my test blocks - can't wait to make a proper project using that die!